I started looking at this because the blurb was intriguing, but I absolutely had to have it once I realized this was the same Michelle Diener who wrote A Dangerous Madness. I had to know how an author who wrote such a fabulous historical fiction with a dash of romance would pull off science fiction. And the answer to how Michelle Diener pulled it off? Brilliantly! So far, this is one of my favorite books this year. Rose was such an interesting heroine. She’s empathetic, warm, loyal, and level headed and logical. Captain Dav Jallan is also an excellent hero, if slightly less fully fleshed out than Rose. And the star of the show was truly Sazo. An emergent Artificial Intelligence being, one so young and mistreated, he has a lot to learn. Yes, I think it is fair to say I liked the characters. What really shines though is the world building and the suspense. Diener wasn’t heavy handed or beating one about the head screaming THIS IS SCIENCE FICTION, it was almost more a social commentary. The Grih are very like humans in many ways, but there are enough social and cultural differences to make them seem alien, and enough to make things more social communication difficulties than any Big-Mis. It made me think of a post I recently read on the book Local Customs. The effect was a bit more subtle than that, but the cultural differences were very real. So it was very interesting to see Rose interacting with all these different characters, and their perspectives of her and she them. And as far as world building goes, since Sazo is an AI he has access to a certain amount of information, so some of the world building was done through him explaining to Rose, but really, Rose and Sazo had a lot to learn and so we were all dropped into this situation where we had to learn quite a bit in a short time. It was well done with no real jarring info-dumps. 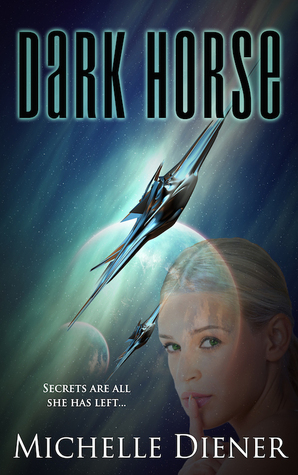 The other interesting thing about the book, is that I truly think the science fiction and mystery aspects could have survived without the romance, and the romance would be just as enjoyable if the alien factor was taken out and you plopped these two characters and their ideals into a romantic suspense. Don’t get me wrong, it blended seamlessly, but it made me give a head quirk and think that even hard boiled non-romantic science fiction readers would still enjoy it. I am trying to figure out how to use BlogLovin’. Anyone else out there use it, or have any advice? 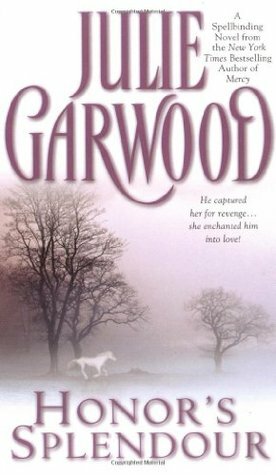 Honor’s Splendour was probably the very last Julie Garwood historical I picked up. I think it must have been due to the blurb. Something about it didn’t appeal to me. But once I got into it, I rated it as highly as any of my other Garwood favorites. 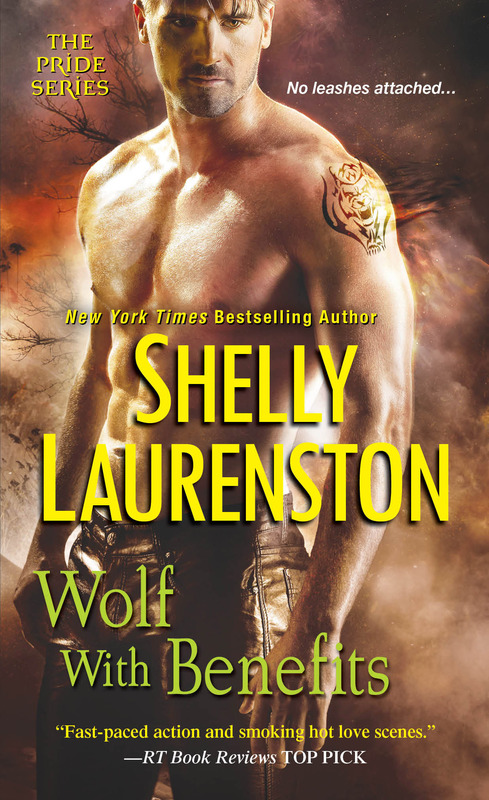 And then it fell off my re-reads radar for some reason. But once I started cleaning up my library for the switch to a Kindle Paperwhite, I just had to re-read it. Honor’s Splendour is available at OpenLibrary, but since I read my personal copy I can’t verify the quality of the scan. The first thing I want to note is that there is one gay character, and he is the villain and painted as a repugnant individual. I know that this (rightfully so) bothers many people, so I figured I would get that information out of the way first. However, it isn’t harped on, and his sexuality isn’t really the source or a component of his villainy, so I was able to get past that part. The second is that a main character was raped. That isn’t precisely a staple of Garwood’s, in fact to my recollection this is the first and last time she’s used this plot. So I would rather readers not be surprised. It is not described and happened prior to the story’s beginning. Ok, those notes out of the way, this is a really sweet story. The thing everyone harps on and sighs over, and rightfully so, is the opening scene. Madelyne steals everyone’s heart, including our erstwhile hero’s, when she risks her brother’s wrath to rescue him, and then warms his frozen feet on her bare stomach. 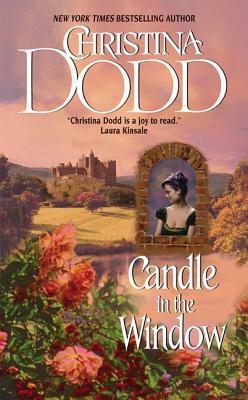 It is one of the best opening chapters of any historical romance that I can recollect. In Duncan and Madelyne we have what should be Garwood stock characters. Duncan who is gruff and alpha but unwillingly kind. Madelyne who is beautiful, compassionate, smart, and brave, but thinks she isn’t. All the usual fare. And yet, these two are more than the sum of their parts. Duncan is so befuddled and sweet as he cares for Madelyne after an injury (and terribly adorable as he lies to himself about his own motives), and kind when he sets Madelyne to caring for his sister. And Madelyne has her own cute quirk, an obsession with Greek history and legend, in particular Odysseus. I have been living on the edge lately! I have started to browse different sections of my local library and came across a local authors shelf. 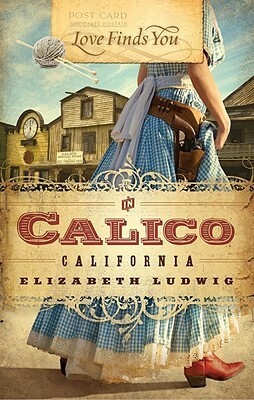 That is where I discovered Elizabeth Ludwig’s Love Finds You in Calico, California. This is Ludwig’s first full length novel and I say she did a fantastic job.The cover really caught my eye, with a pistol and bold red boots! I decided that I had to give this western a chance. I am glad I did! While this is not something I would have usually gone for, I could appreciate the author’s work and style throughout the novel. I generally don’t read books with a strong religious presence, but in this storyline, it worked really well. If I had to describe this title in a single sentence, it would probably go something like this, “Ludwig captures the purity and innocence of budding romance, set against the backdrop of sorrow and mystery”. Abigail Watts and her father Anson, made their way out West to reap the benefits of the booming silver mining business found in Calico, California. Without her mother’s guidance, Abigail relied heavily on her father, and he on her. However, when a tragic, albeit suspicious, accident claims the life of Anson, Abigail must fend for herself, alone, in the Wild West. With the help of Nathan Hawk, widower and father to a young daughter Lizzy, Abigail is determined to uncover the truth about her father’s demise. Together they will find truth, and maybe true love. I really, really enjoyed this book. There weren’t any steamy romance scenes, or foul language, nothing that would make my Grandmother blush, and I don’t think adding any of that would have worked with this couple. They each needed simplicity, honesty and love; nothing more. If you were looking for a quick, heartwarming read, this would be a great choice. My only critique is that it was too short. I want to know what happens to this small town, and the book really offered a lot of opportunity to expand on that. The magic that is library cards! Seriously, if you live in Texas and you love to read, drop what you are doing and read on. This will be the best news you have heard all year. 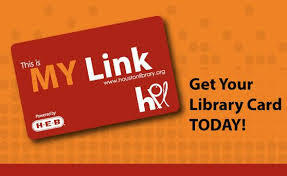 The Houston Public Library has a provision where if you are a Texas resident then you can get a public library card from them for FREE. You fill out their application and scan that and your ID and either mail or email it to them. It really is that simple, I have mine and have already been checking out ebooks from Overdrive. So for residents of Texas it is free. But what about non-residents? For you guys the charge is $40.00 per year. But look around, because chances are good that your state offers something like this too. And if anyone out there finds other options that are either free or available for a nominal fee, please respond in the comments. Surely someone out there has already started compiling these kinds of lists. I’ll probably come back and make this post more asthetically pleasing, but for now here’s a link to additional cities that offer this.